One of the best apps in the Ubuntu Repository is Filelight. Filelight will scan your folders or file system & show you very quickly where your hard disk space has gone. It is not easy to describe how it displays the data but check it out. Have an over efficient operating system? Ubuntu has already on boot created RAMDisks for you by default but they are a mere 4Mb or something. Now you just need to dump some stuff there, remember it will be very fast but dont shutdown without backing it up first because you will need to reformat the drive on every boot! I only realised today how easy file sharing via ssh really is. The only prerequisite is that the ssh server is installed. Then on the client just throw this into GNOME on your client & the file system will appear as if it was local. 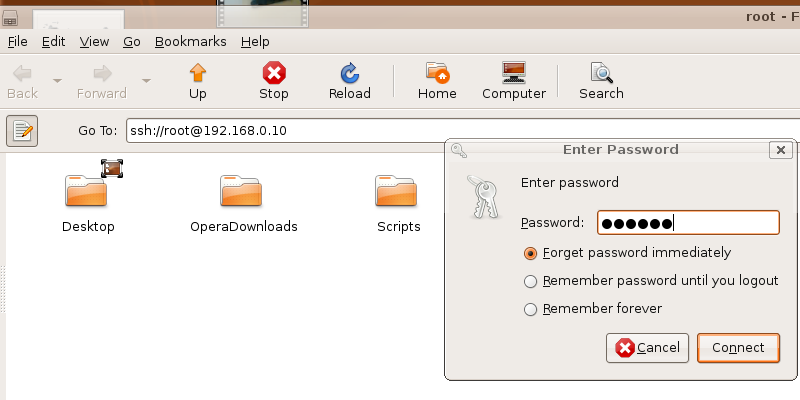 The remote access provided by Gnome comes in the form of the Vino Vnc Server.